American Wolf: The Beatles: The Purple Album. One of the ways in which The Beatles were revolutionary was that they defied greatest hits collections. Most bands at the very least bank on them, & at most live off of them. Even artists as influential, established, album-centered, & varied as The Byrds, Sly & The Family Stone, Al Green, & Simon & Garfunkel have released essential greatest hits albums, which have become staples of their catalog. Not so with The Beatles. While they were together, they authorized only one greatest hits collection, the UK-only A Collection Of Beatles Oldies, which was released for the 1966 Christmas season once it became apparent that no proper studio album would be ready. A Collection Of Beatles Oldies was something of a missed opportunity. What could have been a definitive summation of their vintage years was instead bogged down by recent material that already had been released on LP, such as the (only) six-month-old "Yellow Submarine" & "Eleanor Rigby," plus non-single cuts like "Michelle" and "Yesterday." Meanwhile, vintage bona fide hits like "Love Me Do" & "Please Please Me" were omitted altogether (probably because they had been released on the Please Please Me LP), along with fine B-sides like "Thank You Girl," "I'll Get You," & "This Boy," none of which had ever appeared on a proper Beatles album. A Collection Of Beatles Oldies tried to split the difference between the old & the new, but in trying to appease both sides, satisfied neither. With the wealth of Beatles' hits, you can't blame them for not even trying again for the remainder of their career. The only exception was the Hey Jude LP, released in February 1970, which contained more recent hit single-only sides like "Get Back," "Lady Madonna," "The Ballad Of John & Yoko," & the title track, along with, oddly enough, the 1964 chestnuts "Can't Buy Me Love" & "I Should Have Known Better," for some reason. It too felt like a bit of missed opportunity. & then...nothing. The Beatles broke up a few months after Hey Jude hit the album racks & all four Beatles went their separate ways. But the temptation was just too great. Then, in 1972, the Alpha Omega bootleg came out, an unauthorized four-LP set that contained eight sides of Beatles hits (plus a few solo ones), arranged largely alphabetically. TV exposure made it increasingly popular, so something had to be done. Beatles manager Allen Klein is credited with putting together 1962-1966 & 1967-1970, a pair of double-LP sets that tell The Beatles story over 54 tracks. 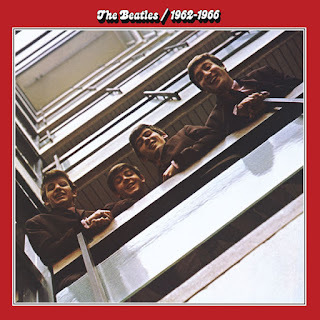 They have since come to be known as "The Red Album" & "The Blue Album," named for the borders around their matching looking-down-the-stairs shots at opposite ends of The Beatles' career. ("The Red Album" cover photo was the cover of their first LP, Please Please Me, while "The Blue Album" cover photo had been planned for the appropriately-titled "Get Back" LP that was eventually released in a different form as Let It Be.) It was actually sequenced by then-Klein employee Allan Steckler, who had previously programmed the Hey Jude LP as well as The Rolling Stones' classic Hot Rocks compilation. Initially touted as "the only authorized collection of The Beatles," both sets were released on April 2, 1973, & were major hits on both sides of the Atlantic. The albums remain the only place where you could get get all of The Beatles' original (UK) A-sides, as well as countless songs that were never released as singles, but are just as recognizable as ones that had. Plus, they had at least one song off of each studio album, giving a balanced collection of The Beatles' discography. The set's successes & setbacks are tied to two ends of the same issue: Time. In terms of time as a linear historical element, the albums do their job beautifully, continuing at a pace that is at once succinct & yet hits all of the key points. Yet in the digital age, another kind of time has become a drawback for the set: The length of a CD. Like most rock & roll artists, as time continued linearly, The Beatles' songs increased in length. The 26 songs that comprise "The Red Album" clock in at under 65 minutes, while the 28 songs that comprise "The Blue Album" come to nearly 100 minutes. Given the modern 80-minute disc as a template, "The Red Album" easily fits on a single disc while "The Blue Album" does not. In order to keep the aesthetics of the set (& the cashflow of a 2-disc priced collection), both "The Red Album" & "The Blue Album" were released on double-disc sets in both the initial 1993 CD release as well as the 2010 remaster. Although loads of bonus tracks could have been added at either point, they never were, thus further cementing the two sets as the (Apple?) core of The Beatles' canon. & with these releases as the only extensive greatest-hits releases authorized by the band themselves, it's unlikely this will ever change. They are, then, more than just a hits collection, but a self-portrait in the form of an archetypal boxed set. With only 217 songs officially released while they were together, "The Red Album" & "The Blue Album" comprise nearly a quarter of them, such that there are two kinds of Beatles songs: Ones that were on these albums & ones that wasn't. I know that songs like "Twist & Shout" & "Do You Want To Know A Secret" were major US hits; "Rain," "Tomorrow Never Knows" & "Helter Skelter" were massively influential; & album cuts from the opening song of their first UK album, "I Saw Her Standing There," all the way through to the medley that closes the last album they would ever cut, "The Abbey Road Medley," are all key parts of The Beatles' story, but they are not stone-cold essentials because they are all absent from this collection. & yet, there are drawbacks to the LPs. Although "The Red Album" covered a slightly longer period of time (with songs that generally shorter than their later counterparts), it contained slightly less tracks, 26 songs to 28 song on "The Blue Album." The former is all the more bizarre when you consider that Revolver--which many consider to be their finest album (if not the finest album EVER)--is represented by a mere pair of tracks, both sides of its "Yellow Submarine" & "Eleanor Rigby" single. Considering that Rubber Soul gets six cuts, one would think they could have thrown on at least two more from Revolver to make each LP set an equal 28 songs. On the other hand, to my ears "The Blue Album" always contained two songs that were not deserving of this Beatles Canon: "The Fool On The Hill" & "Old Brown Shoe." Both are great songs in their own ways, but not classics in their own right. (I looked the other way on a third arguably dubious choice, "Octopus's Garden," because it's obvious a ploy to get a Ringo composition in there, but it also fills out Abbey Road's representation to four songs.) If you take out "Fool" & "Shoe," you get an equal 26 songs for both albums. But in my Beatles analysis, I went a slightly different way. I realized that when you shaved off two of the Rubber Soul cuts from "The Red Album" (I opted for the fine-but-least-essential "Drive My Car" & "Girl) & "The Fool On The Hill" & "Old Brown Shoe" from "The Blue Album," you are left with 50 songs. Furthermore, if you move all of the material through Sgt. Pepper onto the first collection, you get a neat 30 songs for "The Red Album" & 20 songs for "The Blue Album," making each fit on a single disc. Finally, I did some nitpicking around with the running order, such as placing "All My Loving" between "She Loves You" & "I Want To Hold Your Hand," since it was released between those two songs, whereas the original running order of "The Red Album" places "I Want To Hold Your Hand" first. I also moved around the order of "Help!" & "Yesterday" to match with these chronologies. For "The Blue Album," I put "I Am The Walrus" after "Hello, Goodbye," since "Walrus" was the B-side & "Here Comes The Sun" after the other Abbey Road cuts to match the running order of the original LP. All are relatively minor switches, but for me tell the more accurate story. & these songs are nothing if not an epic in rock & roll storytelling--collectively, they quite literally tell the story of modern rock itself. The result is the 50 songs that comprise the official Beatles Canon. You get every UK A-side & every UK & US #1 hit, plus four cuts apiece from Help!, Rubber Soul, Sgt. Pepper, Abbey Road, & three cuts apiece from A Hard Day's Night, "The White Album," & Let It Be. Only Revolver gets underrepresented with two songs, but that's just a flaw in the initial program. It's hard to go much lower than 50 songs when it comes to The Beatles, because then you have to start choosing between hit singles & key album tracks. & once your down to one disc's worth, that's why 1 was invented. Even though I will always hold a strike against it for omitting "Strawberry Fields Forever"--but that's a whole other story.